An indictment prepared by an İstanbul prosecutor seeks a prison sentence of from 7.5 to 15 years for Minure Açıkkollu, wife of Gökhan Açıkkollu, a teacher who was tortured to death while in police custody in the wake of a coup attempt in Turkey on July 15, 2016 over alleged membership in the Gülen group. According to the Diken news portal, Minure Açıkkollu is accused of using a smart phone app called Bylock, which Turkish authorities believe is a communication tool among supporters of the Gulen group, accused of masterminding the July 15, 2016 coup attempt. Tens of thousands of people, including civil servants, police officers, soldiers, businessmen and homemakers, have either been dismissed or arrested for using ByLock since the failed coup last year. Among such arrestees is Amnesty International’s Turkey bureau chief, Taner Kilic. Gökhan Açıkkollu was a history teacher in İstanbul. What makes him memorable is that he is one of the hunreds of thousands of people who have been victimized by an ongoing purge carried out by the Turkish government since a coup attempt on July 15, 2016. 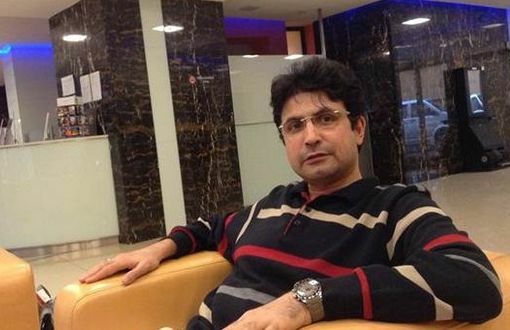 Açıkkollu was detained on July 24, 2016 on coup and terrorism charges and remained in police custody for 13 days, during which time he was subjected to both physical and psychological torture, according to the official autopsy done by the Institute of Forensic Medicine. He was never officially interrogated, and the police did not even take a statement from him. Instead, he was taken from his cell every day to face torture and rushed to the hospital when his condition deteriorated, only to be shipped back to detention. He told doctors about the abuse and torture; yet, in some cases his statements were not even registered in medical reports, and evidence of physical abuse was covered up under pressure from the police. Prof. Dr. Şebnem Korur Fincancı, president of the Human Rights Foundation of Turkey (TİHV), said in a report that Açıkkollu had died from a heart attack stemming from the torture to which he was subjected. According to the report, Açıkkollu was beaten, slapped in the face, kicked in the rib cage, kneed in the back and his head banged against a wall. His medical check-up before he was put in detention showed no signs of any heart troubles; yet, he was pronounced dead due to heart failure. When he collapsed in his cell, emergency services were belatedly called and he died in detention, although official records were doctored to indicate that he expired at the hospital. Açıkkollu’s family learned of his death when they were called to the İstanbul Institute of Forensic Medicine, where Açıkkollu’s ill treatment continued even in death. They were told the funeral could be held on condition that he would be buried in a graveyard set aside by the Greater İstanbul Municipality for alleged “traitors,” despite the fact he had not been tried, nor even interrogated. Imams assigned by the Religious Affairs Directorate (Diyanet) had refused to conduct the funeral prayer for Açıkkollu. 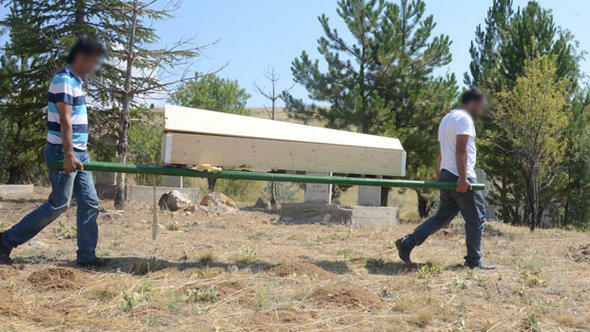 His family had to embalm the body themselves and took him to his hometown in Konya province in their own car. Here, too, the imam of the local mosque would not officiate at the funeral because of instructions issued by the Religious Affairs Directorate that “the funeral prayer will not be performed for traitors.” As a result, his last rites were said by his close relatives. In Aug 2017, a public prosecutor in Turkey decided to drop an investigation into the death of the teacher. Public prosecutor Burhan Görgülü closed the investigation file on the grounds that “there was no malicious intent or negligence.” However, the official autopsy done by the Institute of Forensic Medicine acknowledged that there were rib fractures and internal bleeding. Yet, the report cited a heart attack as the cause of death without elaborating on what might have caused him to suffer heart failure. According to information provided by his cell mates, he could not tolerate being exposed to violence and receiving threats and insults to his family and screamed:, “I cannot bear any more. I will say whatever you want. It is enough. Stop.” But his police statement was not made official. However, prosecutor Burhan Görgülü concluded that there was no foul play in the death of the suspect in custody and dismissed the probe. He did not bother to take depositions from the witnesses who said they were ready to testify. Açıkkollu, who graduated from the history department of Konya Selçuk University, was married with two children. He took a job at a public vocational high school in İstanbul in 2012 as a history teacher after working for private educational institutions affiliated with the Gülen movement. 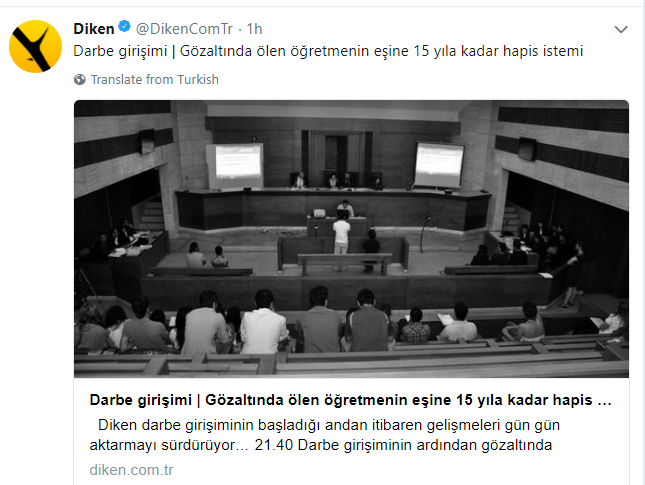 July 15, 2016, the day the failed coup bid, was in fact the birthday of Açıkkollu’s son, who was preparing for the University Entrance Exam (YGS). The family had planned to cut a cake in the evening when they gave him presents. But everything was turned upside down when the terrible events started unfolding that day. The wife of Açıkkollu, Mümine Açıkkollu, a government employee with 23 years of service, was also discharged under Decree Law No. 675, which was issued on Oct. 29, 2016. She was detained by police officers who went to their home on Feb. 24. She was questioned by the same prosecutor, Can Tuncay, who had detained and questioned Gökhan Açıkkollu. She was released on the grounds that she had no ties to the Gülen movement. Severe trauma has taken a toll on the children as well. Their son received high marks on the university entrance exam but gave up his dream of becoming an engineer. He wants to study law instead now to fight against injustice. The youngest member of the family is in third grade. Although she has received psychological support, she cannot sleep without embracing her father’s photograph at night. Almost on-and-a-half year after Açıkkollu’s passing, something intereshing happened on Feb. 27, 2018. He was found innocent and “reinstated” to his job by the Turkish government. 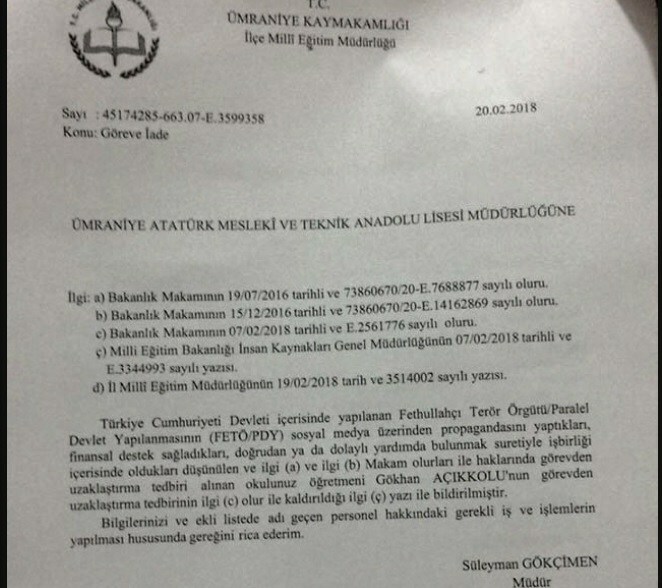 Açıkkolu’s wife received an official statement returning her husband to his former position as a history teacher, indicating that the Ministry of Education at least no longer believed him to have been involved in the coup attempt. “He was innocent,” she wrote on Twitter. Turkish government blames the Gulen movement for the July 15, 2016 failed coup and calls it FETÖ, short for the alleged Fethullahist Terror Group. The Gulenists deny involvement in the coup and any terror activities. Some 150,000 people have lost their jobs mostly over Gulen links and over 150,000 have passed through custody since the summer of 2016.